March 29 – The Texas Department of Insurance, Division of Workers’ Compensation (DWC) announced they will be reviewing the “Old Law” rules – Chapters 41-69, of Title 28, Part 2 of the Texas Administrative Code. DWC is accepting public comments on whether the rules still have a reason to exist and whether these rules should be repealed. 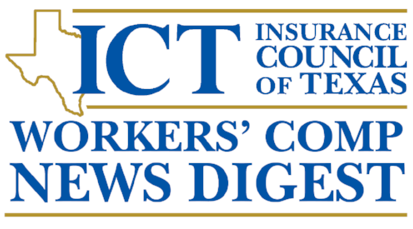 March 19 – DWC announced that the discount and interest rate provided for by the Texas Workers’ Compensation Act has been set at 6.02 percent for April 1, 2019 – June 30, 2019. March 18 – WorkCompCentral.com reported that air ambulance company Phi Air Medical has filed for Chapter 11 bankruptcy protection. The air ambulance company is at the heart of a dispute over whether air ambulance firms can be bound by workers' compensation fee schedules. The bankruptcy filing in the Northern District of Texas, PHI said the move was triggered by its inability to repay $500 million of unsecured loans. March 14 – DWC announced that Commissioner of Workers’ Compensation Cassie Brown adopted a revised procedure for evaluating designated doctor performance. The evaluation procedure provides for the review of the quality of designated doctor decisions, as required by law. March 7 – The Houston Chronicle reported that small businesses opted to drop their workers' compensation subscriptions between 2016 and 2018 according to a survey of over 2,000 Texas businesses conducted by the Texas Department of Insurance, DWC. March 6 – The Insurance Journal reported that the U.S. Department of Labor’s Occupational Safety and Health Administration (OSHA) has cited Bruce Foods Corp. – a Mexican food manufacturer based in El Paso, Texas – after an employee suffered an amputation. The company now faces $194,350 in fines. March 5 – OAOA.COM reported that Texas Mutual Insurance Company awarded a $100,000 grant to Midland College to continue funding the Risk Management Institute at Midland College. The Risk Management Institute provides workplace safety courses for community employers, workers and the general public. March 26 – WorkersCompensation.com reported that Medicare is not the only federal entity seeking reimbursement from the workers’ compensation system. The Veterans Administration is also a secondary payer and needs to be considered for affected injured workers. March 24 – WorkersCompensation.com reported that the American Society of Safety Professionals observed the 108th anniversary of the deadly 1911 Triangle Shirtwaist Factory fire in New York City that spurred workplace safety. The fire killed 146 garment workers. March 22 – The Insurance Journal reported that Mitchell International’s product management and strategy group leader, Shahin Hatamian, recently spoke with Insurance Journal’s Elizabeth Blosfield about how technology has been transforming the workers’ compensation industry. Hatamian discussed some of the new challenges workers’ compensation insurers may face as a result of technological changes, as well as the benefits of the increased use of technology in workers’ comp and some of the emerging technologies that are still on the horizon for insurers. March 21 – Business Insurance reported that a white paper by Global Risk Consultants Corporation said employers need a comprehensive strategy to manage dangerous combustible dust, which is present in an array of industries, can cause catastrophic injuries and death. The white paper also highlights the U.S. Chemical Safety and Hazard Investigation Board’s new Call to Action, focused on combustible dust hazards and the continued need for awareness, protection and prevention of tragedies detailed in the white paper. March 15 – The Claims Journal reported that some 300 health professionals signed a joint letter to the director of the Centers for Disease Control and Prevention to issue “a bold clarification” of the CDC’s policy on tapering long-term users of pain medications off of the drugs. The letter says that after the guidelines were adopted, many doctors and regulators incorrectly believed that the CDC had established a daily dose limit of 90 mg of morphine equivalent and imposed payment barriers and explicit taper plans as a condition for authorizing refills. compensation insurance industry will need to adopt the spirit of open-source development by defining non-proprietary functional modules whose needs invite the tech world and spark creative innovation. March 5 – The Claims Journal reported that U.S. companies installed more robots last year than ever before, as cheaper and more flexible machines put them within reach of businesses of all sizes and in more corners of the economy beyond their traditional foothold in car plants. Pressure to automate is growing as companies seek to cut labor costs in a tight job market. Many companies that are considering bringing work back from overseas in response to the Trump administration’s trade wars may find automation the best way to stay competitive, even with higher-cost U.S. workers. March 1 – The Office of the Texas Governor announced that Governor Greg Abbott has reappointed Jessica Barta to the Injured Employee Public Counsel for a term set to expire February 1, 2021. The Public Counsel helps injured employees in the workers' compensation system, oversees the ombudsman program, and advocates on behalf of injured employees. March 1 – WorkersCompensation.com reported on a 2019 WCRI Annual Conference keynote speech by Dr. John W. Ruser, WCRI and Prof. Alan Kruegar, Princeton University that focused on the opioid epidemic, participation in the US labor force, and the state of the US economy.